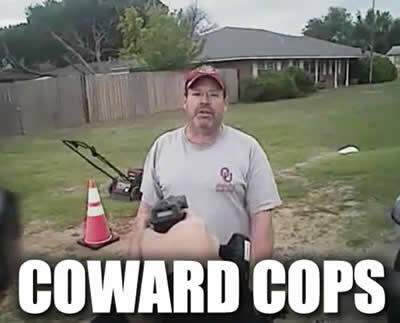 North Enid Oklahoma Officer John Miller is an example of the problem cops hired in America today. There is something taught called “The spirit of the law and the letter of the law”. This is how people lose respect and government cashes in on the tax payer. The same people who make government possible by paying taxes. One of the joys of small town living is being able to socialize with one’s neighbors without harassment. But that simple pleasure of life was made much more difficult when an overzealous officer of the law, North Enid Police Officer John Miller, decided to write a motorist a ticket for stopping to say “hey” to a friend. While there are signs all along the road for no one to park on the side, one lady decided to stop her Jeep, roll her passenger window down, and say “hello” to a good friend, Physical Therapist Gary Duckworth. Duckworth had been mowing the lawn but killed the motor on his push mower to say hey to his friend, Kali Wood. Little did she know she’d be targeted for a ticket, for parking, not stopping to spread some community cheer. Officer John Miller wasted no time, it seems, in writing Wood a ticket for parking on the road. Duckworth then attempted to rationalize with the officer John Miller, who simply wasn’t standing to reason with the health professional. It must be noted that the roads, neighborhood roads, have no double yellow lines, and may not even be within the jurisdiction of the police department as state maintained roads. Nevertheless, officer John Miller followed through with presenting Wood her ticket and telling her the fine was $25. The heavily redacted video (done so by the police department), doesn’t show the entire interaction, nor the discourse exchanged between the two. But, before leaving, however, Duckworth decided to take the opportunity to lecture officer John Miller on what he could have done. “Your job is to protect and serve,” the physical therapist said. “You could have at least come by and at least told her, ‘you need to move’.There are signs up, really?” Wood asked. officer John Miller ignored Duckworth, even after he said, “Excuse me!” Again he said, “Excuse me!” and approached officer John Miller on the side of the road. “If you think you’re justified to pull a taser on me, just because you don’t want to answer my question, that’s a bunch of (inaudible),” the healthcare worker said. Duckworth told officer John Miller he’d be hearing from his lawyer and promised not to let the issue go away quietly. To many, who saw the video on Facebook, it seemed like a reasonable request. But to officer John Miller , the law was a little more cut and dry. Stop and get a ticket. That’s precisely what Wood got. She has a court date, and will surely be accompanied by many of her fellow Enid community members who are a little more than outraged by the trigger-happy ticket pusher and his speech with a long-standing member of the community. For their part, the North Enid Police Department is standing by officer John Miller, even releasing video footage of the incident and saying an independent committee of community members had reviewed the interaction and concluded, “acted within department policy and his training.” However, after receiving so much backlash, the department pulled the video.